Offering you a complete choice of products which include industrial steel pallets, stainless steel pallets, steel drum pallet and steel pallets. 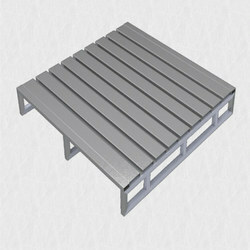 Being one of the reputed organizations in the market, we are engaged in manufacturing and supplying an extensive range of Industrial Steel Pallets. Being one of the reputed organizations in the market, we are engaged in manufacturing and supplying an extensive range of Single Deck Stainless Steel Pallets. 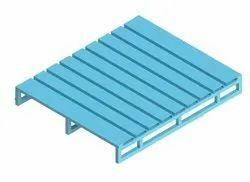 Widely used in different industries to transfer different type of items, these pallets are manufactured by our proficient professionals using quality approved steel and advanced technology. Furthermore, these pallets are highly praised by our customers for their various features like high strength and durability. Backed by a team of experienced professionals, we are offering Steel Drum Pallet, which is made to store two drums per pallet in horizontal condition. Developed from MS pressed channels / rolled sections / Formed sections, this is also stringently tested on various parameters. Also, each pallet can be moved individually or by the stack with a forklift truck. Our offered Steel Drum Pallet can be availed in different specifications and gives the quickest, safest & easiest method of moving and handling loaded steel drums.